PCLinuxOS - the Big Daddy of Desktop Linux: iBall NetTop 009 Cabinet - Flaw in the Design! iBall NetTop 009 Cabinet - Flaw in the Design! For long I was in the opinion that iBall is a leader/pioneer in IT products. My last encounter with its NetTop 009 (for my Intel D410PT board) proved that false in many ways, most important ones among them are: shoddy product quality and dumb customer support. The company has launched first ever (in India) mini-ITX cabinet specifically for mini-ITX motherboards with integrated atom processors. This tiny cabinet was a godsend for the first generation of Intel essential boards (D945GCLF and D945GCLF2) with Atom Diamondville processors – Atom 230 (uni-core) and Atom 330 (dual-core). The marriage of those Intel essential boards with iBall nettop 009 is blissful because both were noisy. Intel was just making into low-power internet-oriented chips keeping price its major USP. The result was a combo of low on power-n-performance cpu (atom 230 and 330), high on power D945GC chipset and high on noise board fan. Then came this cabinet iBall NetTop 009. Competition became fierce with VIA's venture with its nano series processors. Intel made head-on innovation on its atom platform. The result was the second generation (Pine View series) of atom processors (D410 and D510) and essential boards (D410PT and D510MU). This time the focus was for a cool-n-quieter experience (fanless and passive cooling support) and less power-usage (NM10 chipset). But iBall still kept on pushing its NetTop 009 cabinet with a noisy rear fan. This cabinet kills the Intel touted experience of quieter performance and low power consumption. Its rear and SMPS fans are enough to kill the show of quietness and power consumption. I doubt the rear fan and SMPS must be generating more power overhead than the board and processor. The company could have come up with a fanless PSU (something like picoPSU) and/or a quieter and better-quality rear fan. SMPS makes the overall environment hotter than it would be with a fanless PSU. Rear fan and SMPS fan create noise in the otherwise completely silent board and cpu. While atom platform tries to save power watt by watt, the extra fan and traditional SMPS kill the attempt by actually consuming more power. Again, a fanless PSU and cabinet would have resulted in much lesser power consumption. The SMPS draws cooler air from outside and throws hot air inside. The rear fan frantically likes to keep things cool and cries. I don't want the Intel D410PT board inside iBall NetTop 009 to do any herculean task. Most probably it will lie on a rack as a headless file server powered by CentOS or Debian. However, in a full AC environment it would have been great if it created no noise. After doing some benchmarks on the board I wanted to make this Cabinet silent and drove to iBall service center at Ashok Bhavan, Nehru Place. But lo! They pretended to be dumb. All of them said that a cabinet can't be quieter. I told that there is a lot of difference in purpose between traditional fully-powered desktops and fanless low-powered nettops. They did not move either. Some at the center frowned to my question regarding a fanless PSU solution; according to them there is no such thing. Wake up iBall, lest others will move their eye balls away from you. i think you are making more noise than the cabinet & fan. even i am using the same cabinet with same configuration & mine is working fine. I had tried other brands also but iBall is simply great in looks as well as performance. What i suggest you is to get your PC clean...as noise may be due to some dirt particles in your CPU. Also check if it is kept on a flat surface. Regarding Service Centers, let me tell you bro, they are one of the best in the industry in providing service. even i had been to their Nehru Palce service center but due to traffic i reached their at 8 pm. I lost hope of getting the service but a very senior gentle man left his seat & attended me personally. this i suppose can only be seen in iBall else all service center guys of any brand just replies 'service center guys have gone home, come tomorrow' But hats off to iBall Service. I am biggest fan of iBall due to service & quality of products. All through you seem an iBall guy. However, you missed a big point here saying "What i suggest you is to get your PC clean...as noise may be due to some dirt particles in your CPU". The reality is the board and cpu both are fanless, they make no noise... only it's the iBall NetTop 009 cabinet with noisy fans that killed the deal. I wish i could also be an iBall guy, but i have my own business to run. As suggested earlier also check the surface you have kept the cabinet. No more flames Anonymous (you never revealed your identity). Good. But as putting cottons in ears, I don't need any. Because I got a picoPSU+mini cabinet, and dumped that noise iball cabinet. No more noise. Cool and silent computing. I also think Iball as a dumb company. But they listen. In my case of IBALL Wireless Set , their modifications to the product are satisfiable. You are right about the PSU issue both in field of noise and power consumption. You have to shell Rs 1000 more but you get a sleek cabinet with/wo adapter. I have seen same Cabinets being used by HCL. The machine was in State Bank of Patiala. Same cabinet but with HCL Stickers. The iball nettop 009 is cheapest but not the efficent and right choice when we are talking about nettops... Money Factor. Everyone can't afford panache. 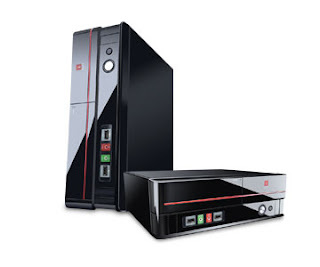 To it Iball is a very good option when you are installing pc at office or working area. My PC has to run at 2.am daily in my bed room. I will definately shell more money. Thanks for sharing it that Iball cabinet nettop 009 makes noise and it should be with fans. But that didnot came to mind before seeing the blog. Thanks! I was going to go with iBall Nettop 009 chassis till I read about it's design flaws on your blog. (http://pclinuxos2007.blogspot.com/2010/10/iball-nettop-009-cabinet-flaw-in-design.html) Now what do you reckon would be a good chassis for this setup. I need around 120 watts PSU for the system. A cabinet with an external power adapter would also be suitable as it will mean one less fan, ie, less noise. Anyway, I'd love to have your opinion on this. Good to know that you also love silent computing. Here are just two points I'd make. 1. I would like you to go for an Asus E35M1-I Deluxe A50M boad. It features the same AMD Fusion platform with E-350 APU. But this board is passively cooled with heavy aluminum heatsinks, and totally fanless. AFAIK, that Gigabyte board you mentioned has a fan. And next time please post your queries as a comment to my blog... that way others will also get to know about the problem and fix. Saumik, I was trying to visit panache.co.in website. it seems the server is down.. if the same happens with you, please google "panache mini-itx cabinets" and visit the cached pages. Thanks Manmath, for following up. Getting a PicoPSU in Kolkata is impossible. The reps in the computer stores haven't even heard of anything like this. When I explained to them what it is, some even laughed at me and told me such a thing is impossible. Anyway, I took the plunge and ordered a 80W PicoPSU off eBay. It has arrived, but the post office won't release it unless I pay them off with Rs. 5K. Bunch of wankers, right? Absolutely. The deal became pricey. I thought panace would have been a value proposition then. Would be nice to know what the NetTop 009 build quality is because I will have to mail order the chosen case. There are few mini-ITX cases available in India. The only fanless case I've found not mentioned here yet is the Coolermaster Elite 100 (http://www.coolermaster.com/product.php?product_id=6623). Right now mini-ITX boards with AMD E-350 Fusion offer the best performance of the low electrical power systems. Available in India: ASUS E35M1-M PRO, Gigabyte GA-E350N-USB3 and MSI E350IA-E45. But I have yet to find a responsive supplier who stocks one of those and a mini-ITX cabinet (with or without fans -- I'm building an office computer). As already commented, well-suited PSUs like the pico are not available in India. Panache offer the biggest range of mini-ITX cases, including the 6600 Storage Box without a PSU -- but no PSUs! This is unfortunate. As well as important environmental considerations, low electrical power computers make financial sense in offices; not only do we pay for the electricity consumed, we also pay capital and running costs of AC, UPS and generator -- which must be sized to match the computers' electrical power. The PSU of my iball nettop got the fried in less than 6months! Even the circuit protection failed and resulted into a fried motherboard! It okay to price your product competitvely, but its not OK to compromise on quality at this extent just to price it competitvely. People will buy anyway, if they hear good sucess stories of your product. Very Correct information . My Iball Smps makes noise from the day 1. I didn'r care. But when I compared it with other CPU's it found to be very noise.I checked for every part- processor fan,MB fan,HDD, CD ROM but it was SMPS fan that was making noise other component being silent. I took the fan to the service centre,they replaced it but the new one again making the same noise.I again took it to the service centre they changed the fan in front of me and let me observe the noise.it was very little noise there(fan noise). But as you have rightly pointed out it is a design defect because what I discovered was that the little Fan noise with faulty SMPS body and Cabinet Design convert that noise into ECHO. There is no solution to this. I will write this to Iball.